The babies they're gonna have, tho. Laura Trott, 24, became Great Britain's most successful female Olympian when she won her fourth gold medal for cycling. Jason Kenny, 28, tied an existing Great Britain record and won his sixth cycling gold. In September, they'll be married and might start popping out future Ledecky-level Olympian babies, but until then, the internet is obsessed with them and their beautiful, golden coupledom. Thank you all for the support, and thanks to a great team that put gb cycling way out in front again...not been a bad week has it? ???? @JasonKenny107 awesome stuff Jason. Team Trotty Kenny would be 13th in the overall medal table. Astonishing. 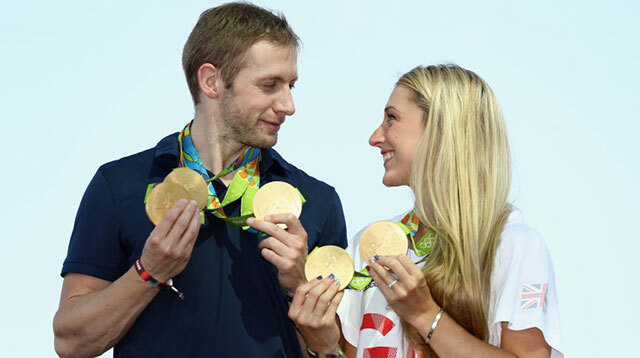 @LauraTrott31 @JasonKenny107 my heart was beating like a fecking shrew throughout tonight. Amazing. Congrats to you both. JK: hi honey, what did you do today? LT: cool. Shall we put them with the others? The pair's 10 medals do put them higher than most countries on the leader board, according to Mashable. If Trott-Kenny were their own country, they'd place 13th overall.